LOCKLINEIn this insane dark comedy, Chinese immigrant Ping is well on his way to become independent after finding a mysterious guidebook hidden in a toilet. In 2017 a team of highly talented international film professionals came together in an abandoned rehab clinic, due for demolition, in the heart of Amsterdam. The location was chosen with the intention of capturing the lead character's psychotic imagination. The team had four days to shoot this colorful short film about Chinese immigrant Ping and to mold his story into an attempt to grasp the essence of becoming INDEPENDENT. The story and script for this film are loosely based on the voyages of director Niels de Vries and his attempts of entrepreneuring in Asia. A windy yellow road which reveals a ton of hardships, but also shows the magical side of life and the spirit of being human. Young and confused Chinese immigrant Ping (Jason Gwen) diligently works in a laundry room to achieve the Western Dream of becoming wealthy and independent. A dream that doesn't seem to come any closer. 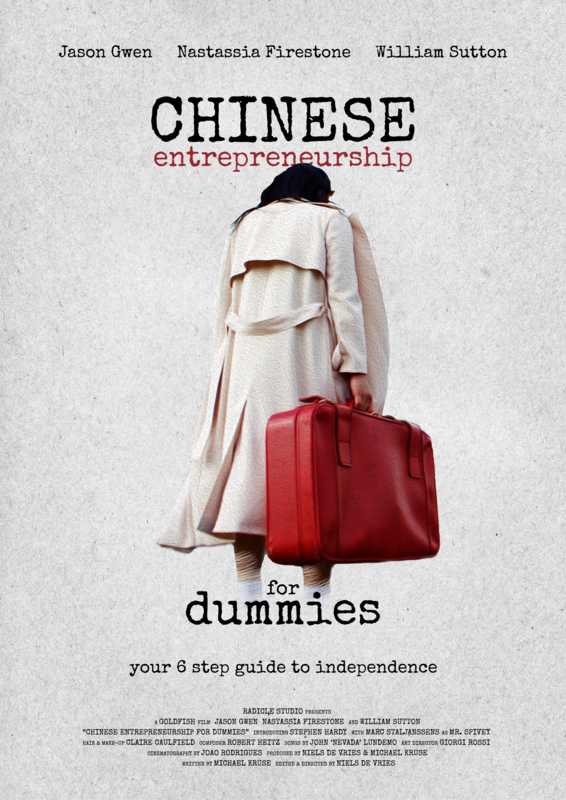 One day Ping receives a mysterious package containing a Six Step Guide to Independence; a book titled "CHINESE ENTREPRENEURSHIP FOR DUMMIES". Finally his prayers are answered and Ping starts to blindly follow the book's guidelines to become a serial entrepreneur. However, Ping finds his journey undermined by Tony (William Sutton), an Irish gangster, who runs a dining facility to cover up his shady business. He warns our Chinese immigrant that it's not wise to interfere with his affairs. Hopefully for Ping the book will show him a way out of this troublesome situation. We set a 30 days campaign to raise a minimum of 4.700 EUR to deliver audiences the unique entertainment this team can bring to the screen. We are currently working on the edit of the film and we need some financial aide to finish our post-production trajectory. The budget that we are looking for will be spend on music clearance, sound design, atmospheric effects, color grading and festival entry fees. Become involved and help us to finish Ping's voyage through transformation. Radicle Studio is an independent production house in The Netherlands. The studio creates its own formats and specializes in film and animation production. Director Niels de Vries always had the gravitas to attract creative professionals from all over the planet but on this production he really lured the dragon out of its den. Teaming with writer Michael Kruse, they are at the heart of this extraordinary project. Director of Photography Joao Rodrigues teaches cinematography at the New York Film Academy and is Managing Director of Shortcutz Amsterdam. His energetic fixation on The Magic Shot got him to capture the human inside our fantasy and beautifully visualize the essence of the characters together with his talented assistant camera Magda Lepczyńska. Art Director Giorgi Rossi brilliantly transformed nothing into beauty. From the ashes he would erect works of art, surreal representations of his fantastic mind. ..and many more who made this production possible. WIN FABULOUS PRIZES! With this donation you get the chance to win PINGS SUITCASE with CONTENT! This amazing prize, used as a prop in the film, has several other rewards concealed in it. Just to give you a tip of the iceberg; you’ll find the official CEFD HAND GUIDE and TICKETS to the private screening. Second prizes will be tickets to the premiere and the production book, third prize will be the production book. All other contestants receive a consolation prize. Xiè xie! For this contribution you will receive a digital THANK YOU CARD and an original digital -BEHIND THE SCENES- PDF, loaded with pictures, stories and funny anecdotes of the production and its shooting days. Duōxiè! You have brought Ping a bit closer to his independence. This rewards includes all of the above rewards PLUS a temporary FILM LINK after it premiered. Wow! Lucky Ping! With this contribution, you will receive all of the above rewards and will get a DOWNLOAD LINK to the film, so you can watch it for ever and ever. PLUS you will receive a digital film POSTER and a PERSONAL THANK YOU from the director. THE FIRST STEP TO INDEPENDENCE IS SET. By helping Ping, you will receive all of the above rewards, PLUS the exclusive rock 'n roll MUSIC ALBUM "the Rocket Chair" by John 'Nevada' Lundemo and the original SOUNDTRACK of the film. YOU ARE BECOMING A SERIOUS ENTREPRENEUR. With your investment you will receive all of the above rewards, PLUS you get two tickets for the PUBLIC PREMIERE of the film (date and place to be specified). YOU CAN ALREADY SMELL THE INDEPENDENCE! For this contribution you will receive all of the above. But instead you and a friend get invited to the PRIVATE SCREENING of the film with the cast & crew. PLUS you get to enjoy the after party with us! BECAUSE ENTREPRENEURSHIP STARTS WITH NETWORKING! ONLY TWO MORE STEPS AND YOU ARE THERE! For this donation, you will receive all of the above PLUS you will find your NAME in the SPECIAL THANKS credits and you will get an exclusive hardcover PRODUCTION BOOK of the film, with pictures, stories and the script, signed by the cast and producers. YOU ARE THE ULTIMATE ENTREPRENEUR! For this you will receive all of the above PLUS you will be credited as EXECUTIVE PRODUCER. You are a crucial part of the Radicle team. YOU ARE TRULY INDEPENDENT! For pulling Ping over the finish line you will be credited as CO-PRODUCER in the OPENING CREDITS. PLUS you get all of the above rewards.